I started this post from the front porch at the Africa Windmill Project office in Lilongwe, Malawi. But time got away from me in the middle of our trip, so I’m finishing this up from the States. 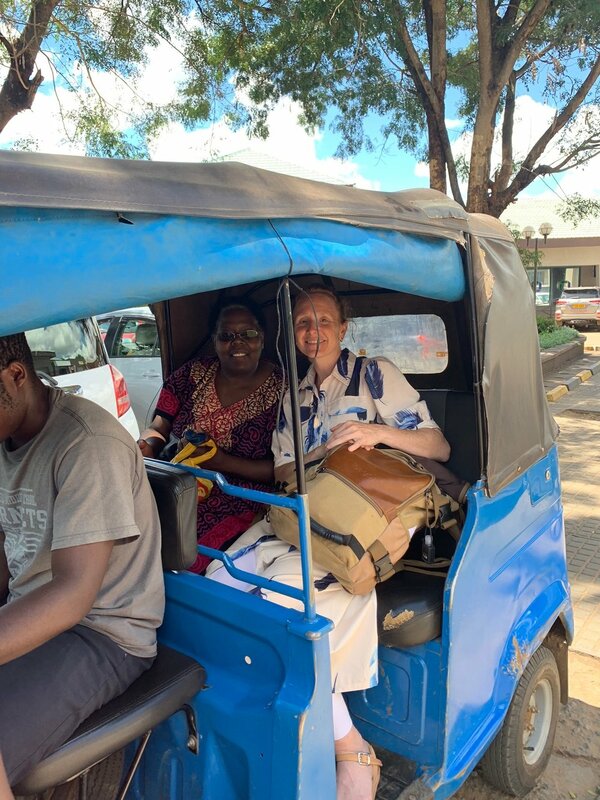 Going back to Lilongwe…on our first Monday in the city there was a slight breeze and the sun was rolling high in the sapphire sky (says my favorite song). 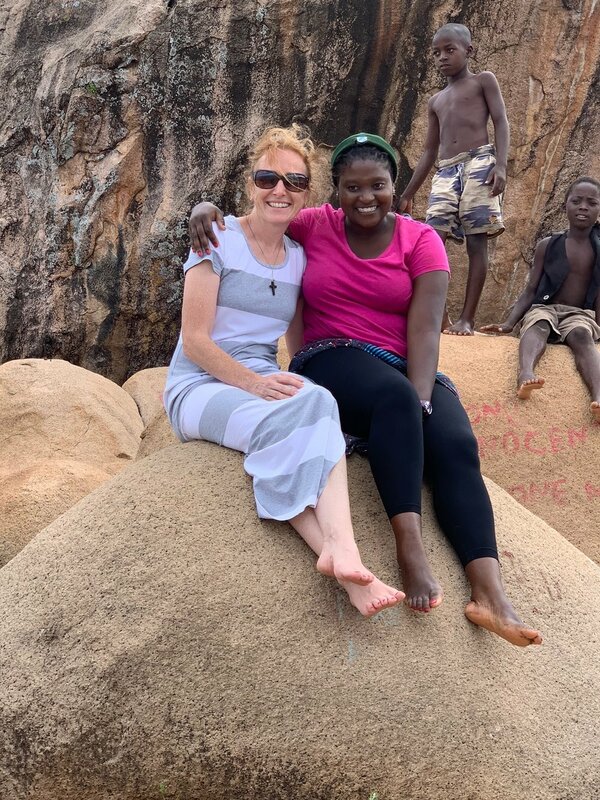 We arrived in Malawi on Friday, March 22 around noon and spent the weekend exploring the city, and learning about the culture that makes up this beautiful space. 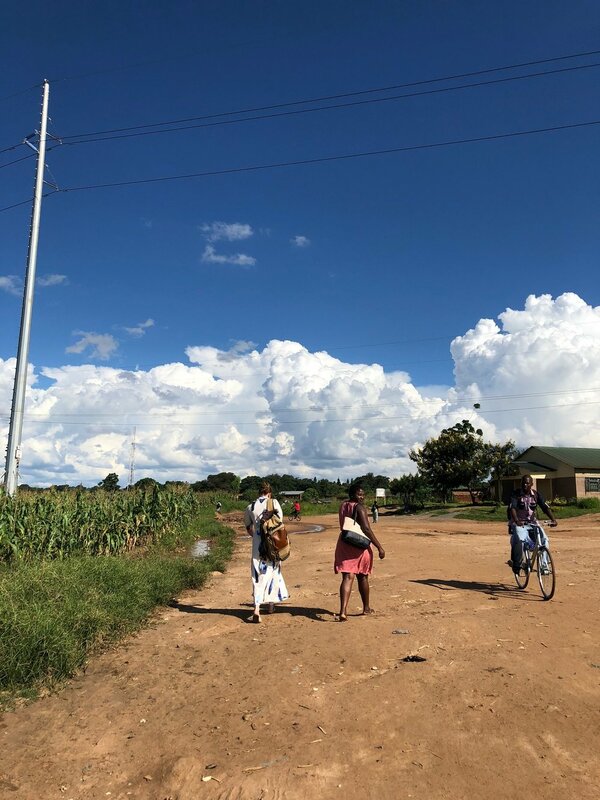 There are many things I planned to blog about: Malawi history and culture, the AWP staff, building community across the globe, Jesus, freedom, hospitality. I have so many thoughts swirling in my head and I'm still trying to process all of it. I want to start with writing about our weekend, sharing some stories and photos that mark our first few days overseas. On that Friday we met up in Johannesburg (Margaret and Wanda coming in from London, Kimberly and Kyrsten arriving from New York City) and took South African Airways into Lilongwe. Upon arriving, we were met by Gibozi, John, and Joseph. They picked us up and we drove to Damron Suites, our home for the week. The goal for the day was to stay awake. Malawi is 6 hours ahead of Florida and Georgia (where Kimberly and Kyrsten reside) and 7 hours ahead of Missouri (Margaret and Wanda's home) so we wanted to adjust to GMT+2 as quickly as possible. After dropping our bags at the hotel, we walked over to AWP's office and met the staff. Gibozi, John, and Joseph then spent the rest of the afternoon showing us around Lilongwe. We exchanged money and picked up some water and fruit from the store. Then we drove around and saw several monuments dedicated to Malawi's first president, Dr. Hastings Banda. One of the monuments was a giant tower, which we then proceeded to climb. The views of Lilongwe were spectacular! We also stopped in to see the new 5-star hotel that was just built. It was gorgeous! From there we picked up some dinner (chicken and chips aka fries) at a local restaurant and took it back to Damron to eat and crash. Day 1 success. Day 2 started strong with breakfast. Our lovely lodge staff made us breakfast every morning, which consisted of fried eggs, sausage, potatoes, and bread. We paired it with coffee we brought from home and had a feast! 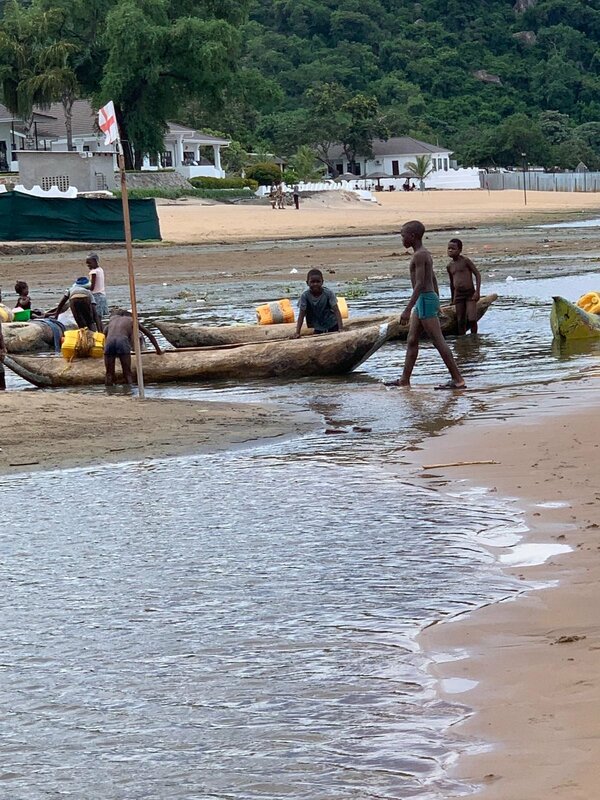 Originally we had planned to spend Saturday at the market and then have some down time, but the previous night we'd been talking to the staff about Lake Malawi. John said it was about an hour and a half drive, but everyone was up for the excursion. So we went to the market in the morning to buy some chitenzis (fabric wrapped around like a skirt) and then we started our drive to the lake. Y'all. The lake was not what I was expecting. When we got out of the car we could hear waves crashing into the shore. We creeped up on the lake slowly and suddenly there was a sandy beach with waves and mountains off in the distant. Words can't do it justice so I'll have to let these pictures speak for me (although, these pictures don't do it justice either). 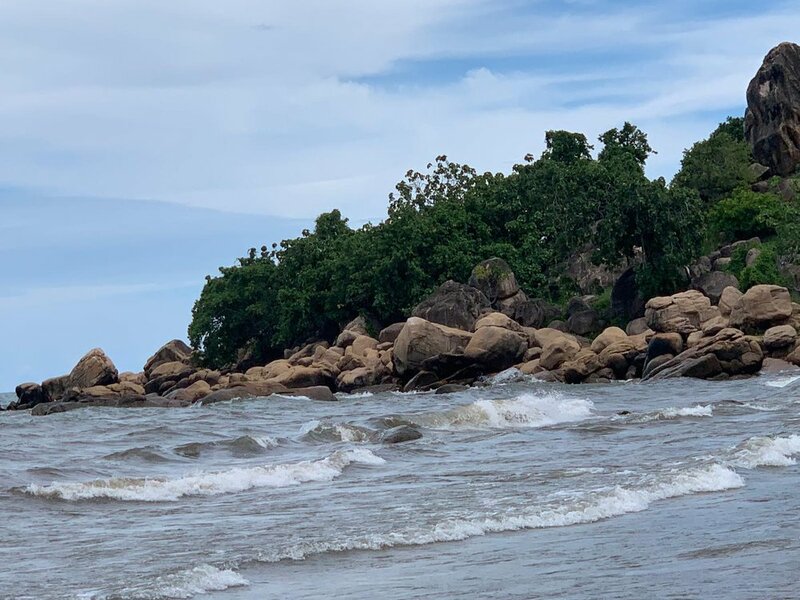 Photos: Lake Malawi (1&2). 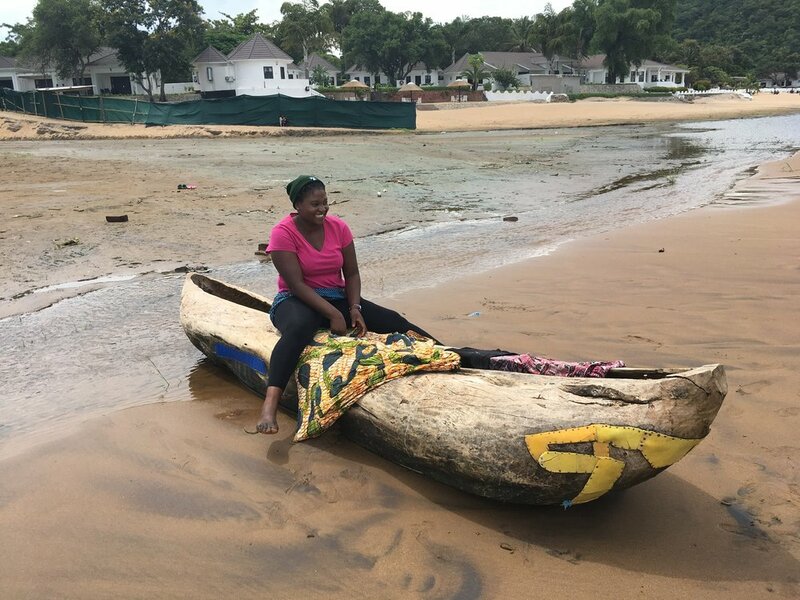 Doris sitting on a boat made from a baobab tree (3). Children playing in the water near the lake (4). Kyrsten, Doris, Wanda and Margaret (5). A Malawi native who was watching the children and washing some clothes (6). Kimberly and Doris (7). John with his fresh fish, ready to start the drive back home (8). We enjoyed lunch at the lake and then started our drive back. Along the way we stopped at some wood carving shops and picked up some fun souvenirs. We had an official lesson in bartering from Doris (thank you, Doris!) and had a lot of fun with the whole experience. We also stopped to take pictures with a huge baobab tree that was by the road. Photos: A giant baobab tree by the road (1). Wanda, Margaret, Kimberly, Kyrsten, and Doris by the tree (2). 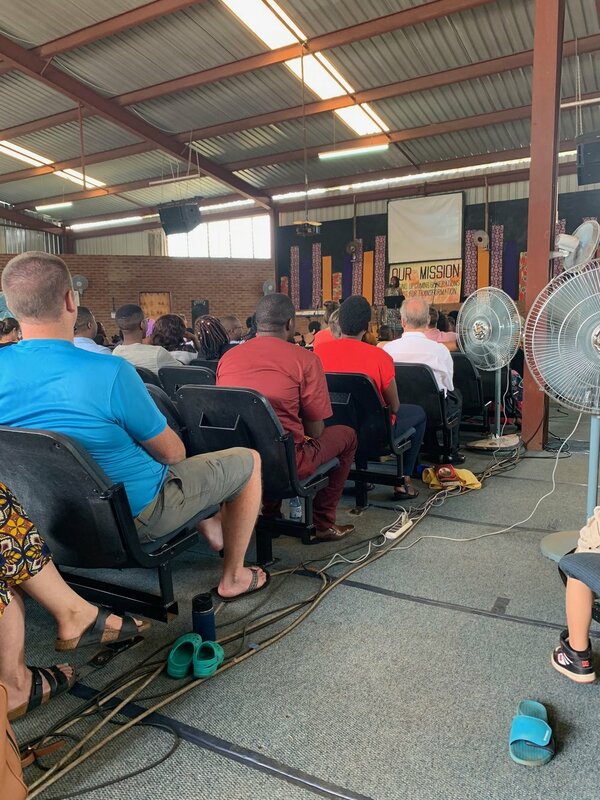 On Sunday we went to Flood Church. Doris attends Flood so we spent the day hanging out with her and exploring the city some more. Doris picked us up from Damron around 9:30am and then we walked half a mile to catch a minibus. The minibus is basically a 15 passenger van that operates like an on-and-off bus. You flag it down, hop in (or squish in depending on how many people are already in the van), and then tell the driver where you need to go. Church was incredible. It was in English (which I was thankful for) and the room was full of ethnicity. Black, White, Indian, Asian. Through singing and worship it was clear that regardless of what we looked like, we were all one body. 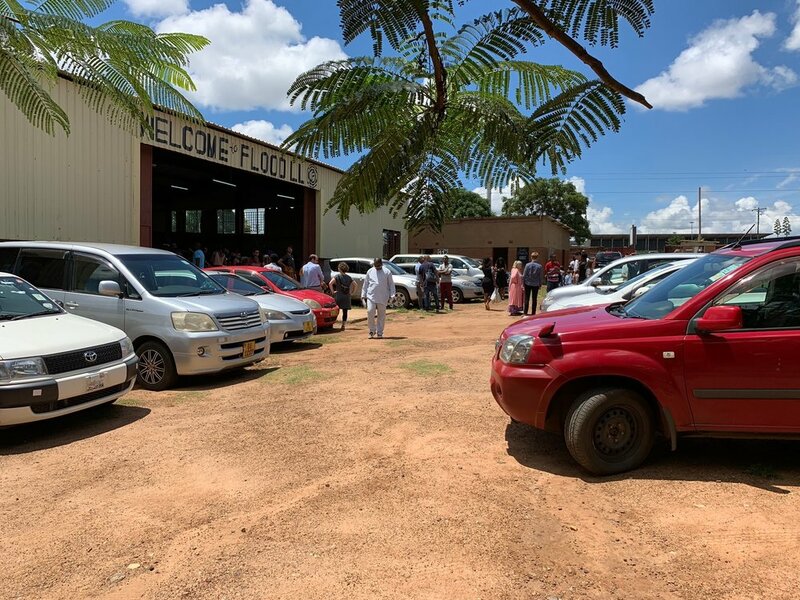 Photos: Flood Church in Lilongwe. After church we walked to the grocery store across the street to pick up some juice and fruit for the evening, and then hopped on a tuk-tuk and got pizza for lunch. After lunch, we hopped another minibus and drove to a tailor shop. We had our chitenzi fabric with us and Doris had a great idea to get some dresses made. We spent some time at the tailor, picking out our dress styles and talking to the tailors (male refugees from Burundi who spoke English, Swahili, and French). It was a neat experience! We then caught another minibus back to Damron. Photos: Walking around Lilongwe (1&2). The minibus that we rode from the tailor's to Damron area (3). Trying out a tuk-tuk (4&5). A Malawi native with her child (6). Fun fact: along the road in Lilongwe there are checkpoints where police stand in the middle of the road and stop cars to see if they have the proper paperwork, updated license, etc. They also stop minibuses if they are traveling with too many people. Like, for example, 19 in a 15 passenger van. Which we were. We didn't have to get out or find a new ride, but the driver did have to have a conversation with the officer. Once we got to Damron we spent some time with Doris learning more about her story. In the evening, Gibozi picked us up and drove us to his home in Area 49 for dinner. We ate with him, his wife, Esther, and their two boys, Israel and Ian. The food was wonderful, but the conversation was even better. We were building community 8000 miles away from home and it was beautiful. Photo: Wanda with Israel (8) and Ian (4).